Papa: Hemingway in Cuba is a 2015 Canadian-American biographical film. It was written by Denne Bart Petitclerc, and directed by Bob Yari. The film is based on events from Ernest Hemingway's life in Havana, Cuba in the 1950s, and on a friendship that developed there between Hemingway and Petitclerc, who was then a young journalist. The film received generally unfavorable reviews. In 1959, young journalist Ed Myers (a character representing Petitclerc) is working for a Miami newspaper. He wants to be a writer and had long admired Ernest Hemingway, then living in Cuba. Myers writes to Hemingway and is surprised when he answers, inviting the journalist to Cuba to go fishing with him. While the Cuban Revolution comes to a boil around them, Hemingway advises Myers on his writing. Myers continues to write articles for his newspaper, reporting on the Revolution. An early scene from the film depicts rebels allied with Fidel Castro bursting into a street near Havana's Government Palace to confront soldiers loyal to the government of Fulgencio Batista. Hemingway and Myers take cover, with Hemingway guiding Myers through the war zone. They gradually develop a friendship and Myers spends an increasing amount of time with Hemingway and his fourth wife Mary. Petitclerc had written the screenplay and had begun working on production of the film at the time of his death in 2006. Production on location in Cuba concluded in May 2014. It was the first Hollywood film to be filmed in Cuba since the 1959 revolution, according to The Hollywood Reporter. The filmmakers received permission to film inside Finca Vigía, Hemingway's residence from 1939 to 1960. The government later adapted it as a national museum. Hemingway wrote For Whom the Bell Tolls and The Old Man and the Sea at Finca Vigía. The film's title, Papa, was Hemingway's nickname. He was called "Papa" by his colleagues and admirers, as well as his family. 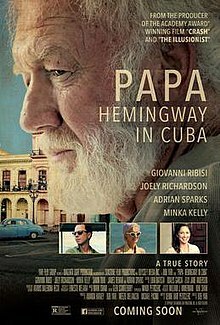 Papa: Hemingway in Cuba received generally negative reviews from critics. As of May 2016[update], it had an aggregate score of 37 out of 100 on Metacritic, based on 17 critics, indicating "generally unfavorable reviews". On Rotten Tomatoes, as of May 2016[update], the film had an audience rating of 77%, countered by a critics' approval rating of 8% (based on 38 critic reviews). A "Critic's Consensus" quoted Hemingway's The Old Man and the Sea (1952) in concluding, "A man can be destroyed but not defeated, although the desultory Papa: Hemingway in Cuba makes one feel as if both can be accomplished by watching a single film." ^ "Papa: film about Hemingway's Havana years raises hope for Hollywood in Cuba". TheGuardian.com. Retrieved November 2, 2016. ^ "Papa: Hemingway in Cuba (2016)". The-Numbers.com. Retrieved November 2, 2016. ^ Blistein, Jon (May 8, 2014). "Ernest Hemingway Biopic First Hollywood Film Shot in Cuba Since 1959". Rolling Stone. ^ a b "Papa: Hemingway in Cuba". Metacritic. Archived from the original on April 29, 2016. Retrieved April 28, 2016. ^ a b c Di Nunzio, Miriam (April 28, 2016). "Papa leaves many unanswered questions about Hemingway in Cuba". Chicago Sun-Times. Archived from the original on April 29, 2016. ^ a b "Hemingway Biopic 'Papa' First Hollywood Feature Film Shot in Cuba in 45 Years". The Hollywood Reporter. May 7, 2014. ^ "Denne Bart Petitclerc". Variety (Obituary). February 9, 2006. ^ Harrington, Mary (December 28, 1946). "They Call Him Papa". New York Post Week-End Magazine. p. 3. Reprinted in Bruccoli, Matthew Joseph, ed. (1986). Conversations with Ernest Hemingway. Literary conversations series. Univ. Press of Mississippi. pp. 42–45. ISBN 0878052739. ISSN 1555-7065. ^ Richardson, Hadley (n.d.). "How Hemingway became Papa" (MP3) (Audio segment (4m 37s) from interview). Interviewed by Alice Hunt Sokoloff. Archived from the original on April 18, 2016. Published at Baker, Allie (June 28, 2010). "How did Hemingway become Papa?". The Hemingway Project. Archived from the original on April 7, 2016. ^ "Papa: Hemingway in Cuba (2016)". Rotten Tomatoes. Flixster. Archived from the original on April 29, 2016. Retrieved April 28, 2016. This page was last edited on 24 November 2018, at 09:14 (UTC).